This card I made for the Stampoutique Challenge, which was to use Newsprint/Old Book Pages. I don't have any old books but I did find a musical score so I hope this counts. I really enjoyed making this card, I am trying very hard to push myself outside of my comfort zone which is much more CAS. Lots of inky fingers which is always fun. I'm the same way (CAS). You've done beautifully with this - love the sentiment, image and how it all comes together with the musical score. It's a gorgeous card.Love that image! This looks really great!! 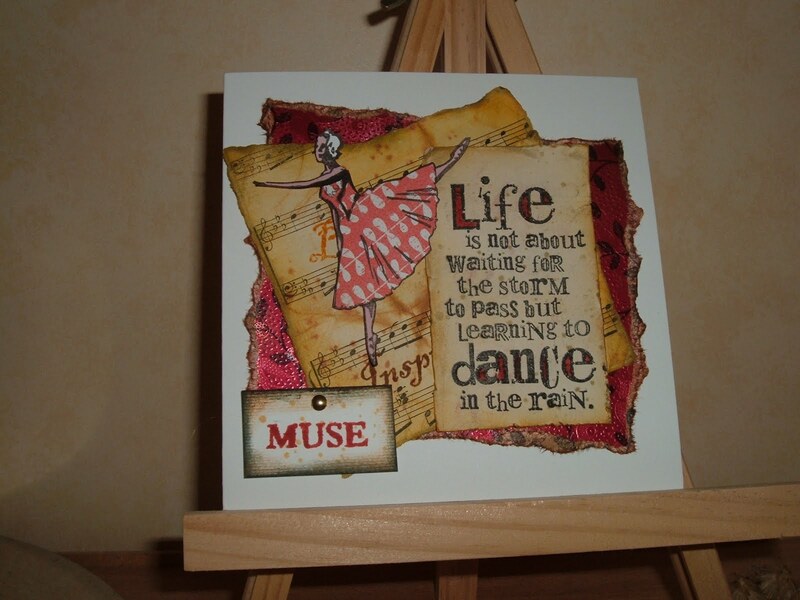 Thanks for joining us at Stampotique Designer's Challenge # 28.
i like the ballerina and the quote is very beautiful.Thanks for playing over at Stampotique Designer's Challenge. Going out of your comfort zone turned out gorgeous!!! Love what you have done and so glad you played along with us at Stampotique Designer's Challenge. Oh, I really like the distressing and tearing that you've added - wonderful! Thank you for joining us for the SDC this week! Best of luck in the draw! This is such a gorgeous card, I love the composition of it. Thanks for joining us at Stampotique. This is fabulous, great card! You've made an unique and fabulous composition! Such a beutifully composed card. Love it! Thanks for joining in with the challenge at Stampotique.